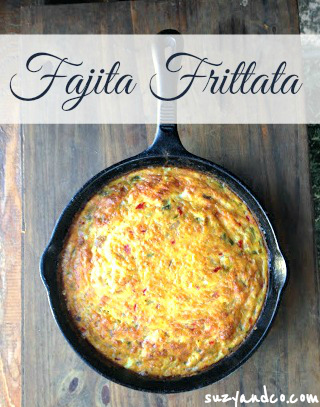 This fajita frittata is a simple way to use up leftover fajitas, either homemade or from a restaurant. I had made some steak fajitas one night and ate them for about three days in a row for lunch. I know some people like to have variety, but for me, if it is a great dish, I don't mind eating it several times in a week. It makes it much easier than cooking from scratch everyday. But even though they were super yummy I was a bit tired of fajitas after that many days. I didn't want to waste them so one morning while deciding what to have for breakfast I thought I could throw them in a skillet with some eggs and I would have an almost instant frittata. It was fantastic, simple, and a quick recipe. In a medium bowl, crack the eggs. Scramble the eggs with a fork. Add the diced fajita and shredded cheese and mix. Place egg mixture in a 10 inch cast iron skillet.